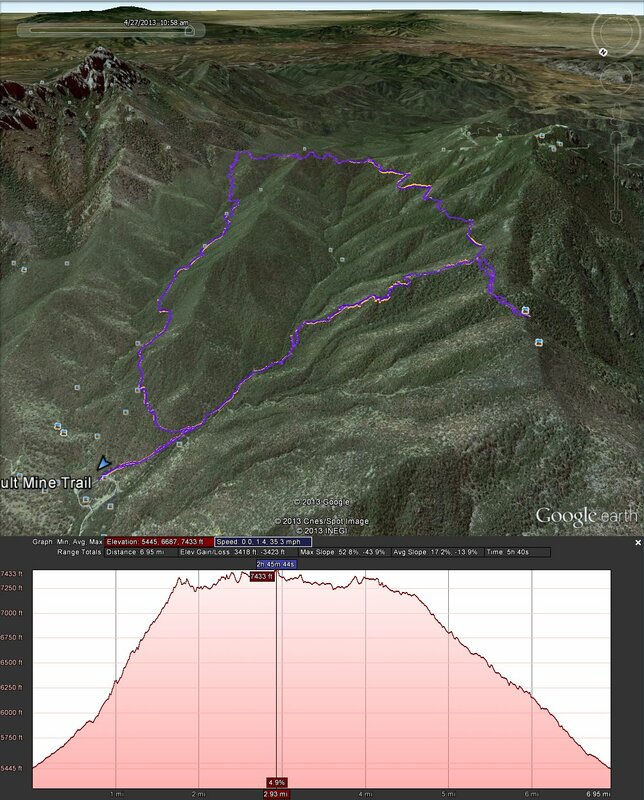 The amazing thing though was the largely level walk back along the Agua Caliente trail that hugs the mountain and ends at Josephine saddle. The forest along this trail is very nice and the views are simply stunning. 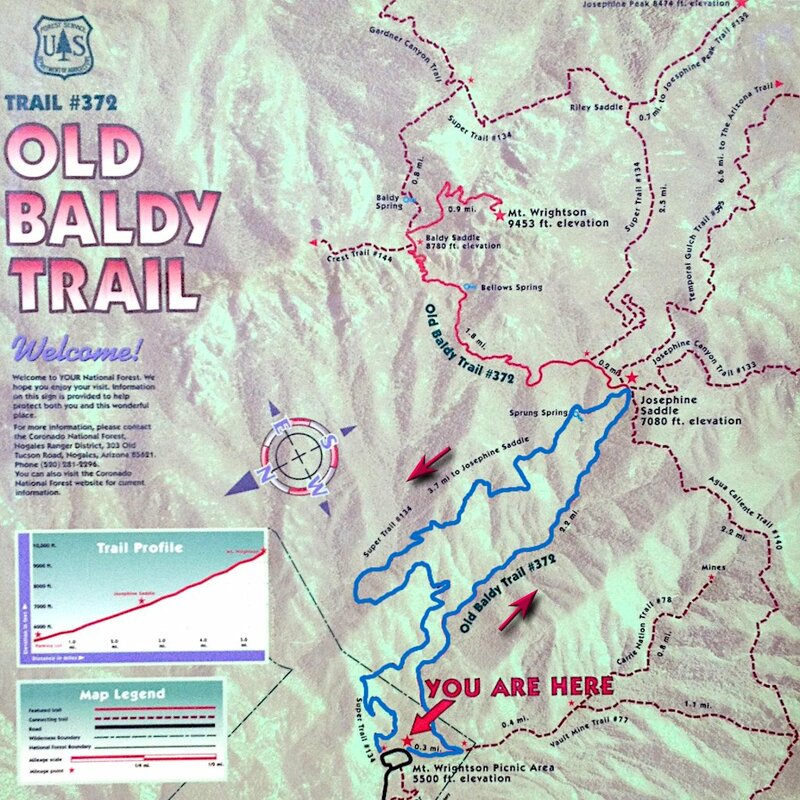 However, it seems most people don’t know about the beauty of this trail as everybody I saw was coming up Old Baldy trail and didn’t seem to know what they were missing by not taking a right turn at Josephine saddle and heading along the Agua Caliente trail. I liked this trail so much I’m thinking of going back again this coming weekend! This tree must have been about eight feet wide! It even had evidence of a sign that was once placed on it but had long since disappeared I searched on Google for any info I could find on this tree but couldn’t find any. I don’t know much about trees, but it looked similar to the pictures of Bristlecone Pine trees which are said to grow especially well along ridges, which is where this one is located. Interestingly, the first item that comes up on Google for a search of “Bristlecone pine Santa Rita” is this link, which is in memoriam for a longtime researcher at the University of Arizona’s Laboratory of Tree-Ring Research who passed away two months ago, but who studied Bristlecone pine trees for years and who also happened to be one of the people who searched for the lost Boy Scouts who died near Josephine saddle in a brutal snow storm back in November of 1958. There is a memorial for the three lost Boy Scouts at Josephine saddle that most hikers pass by. Just last year, the mountain gave up one of its last secrets about those boy scouts, which you can read about here. And a book was written three years ago about the incident by a sister of one of the surviving scouts (Death Clouds on Mt. Baldy). 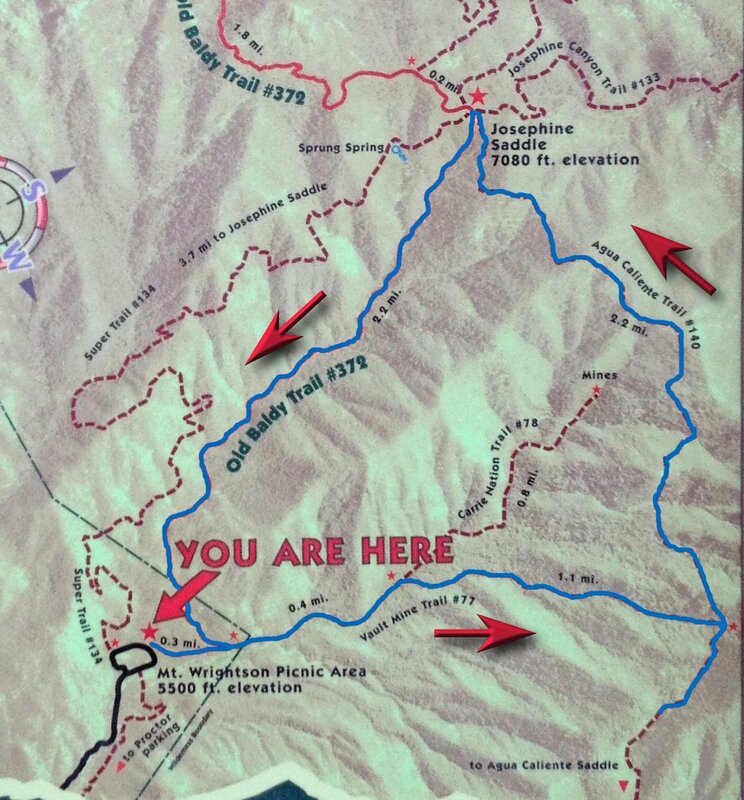 That surviving scout, Ralph Coltrin Jr., apparently still gives guided hikes up those same trails. For pictures of Ralph and more of the story from last year go here. One last note. 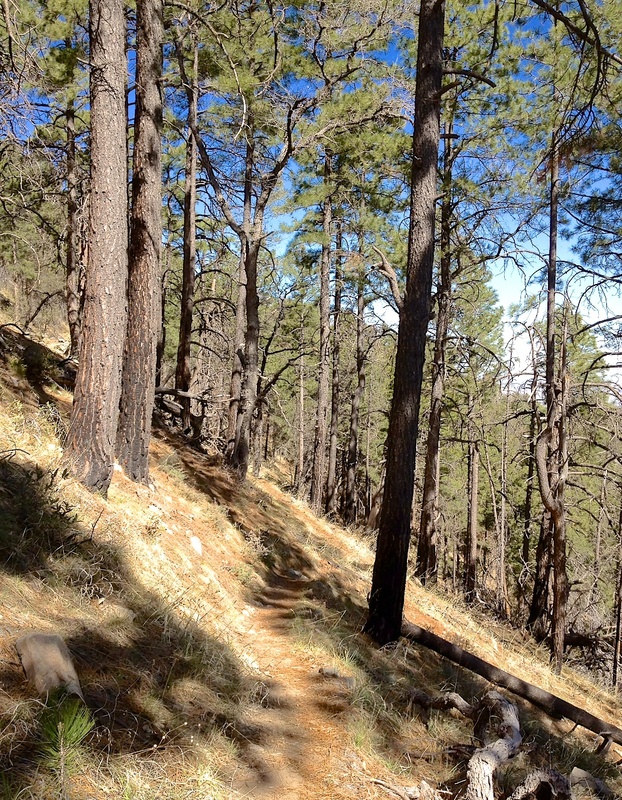 The signs on the trail say that the Vault Mine trail is “very steep”, and compared to Old Baldy trail, that is accurate. However, the trail was not a difficult one to go up. 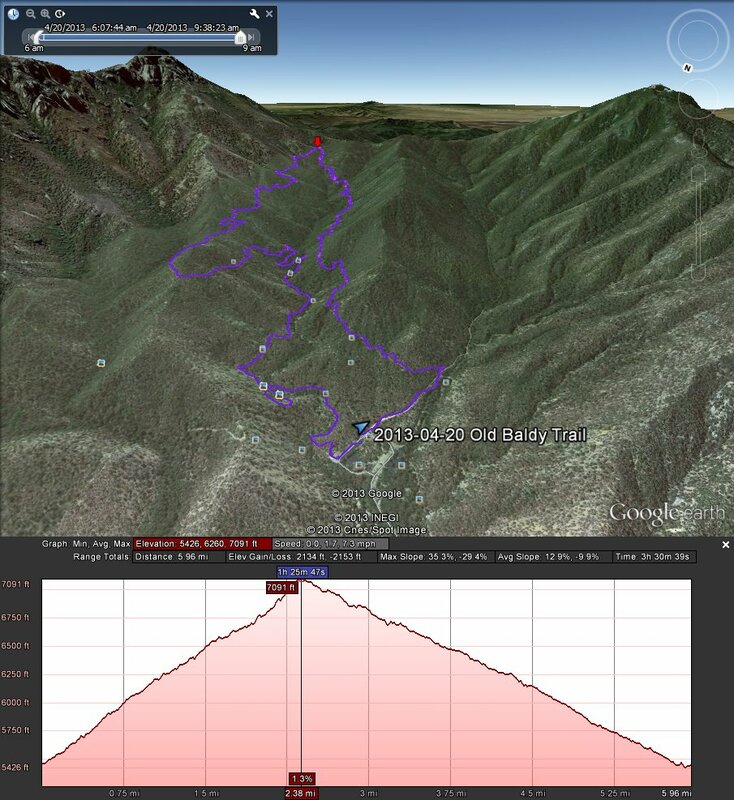 It was certainly not at all like the “scary steep” Linda Vista trail that I recently went up on Pusch Ridge. That trail made me quite nervous to both go up and down on. The Vault Mine trail, while steep, was not a scary trail. 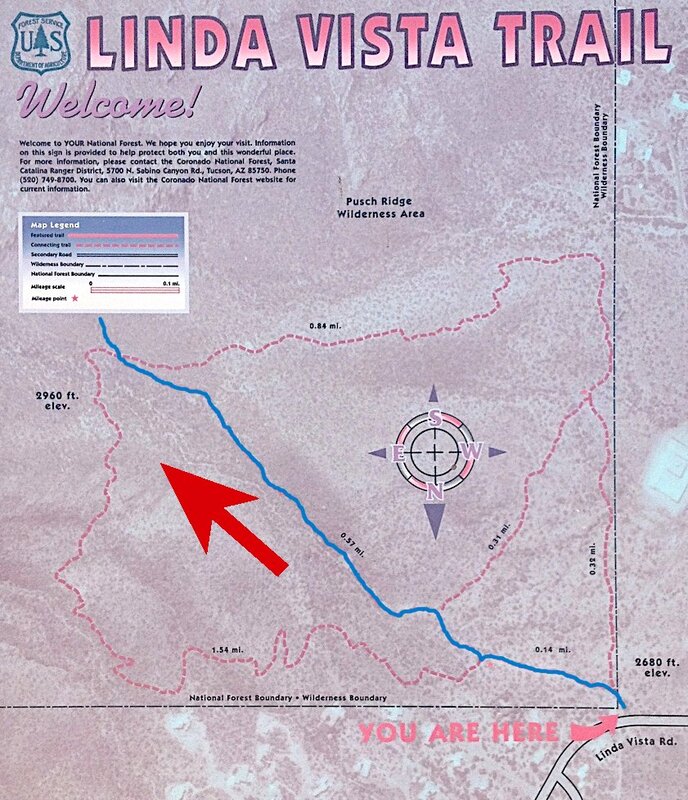 The map at the trail head does not show the trail that leads up to the summit, but it is easy to find and follow. This is the view from the parking lot. It doesn’t look that high does it? And here is the view as the trail starts going up. Further up, the views get more dramatic, but what this photo doesn’t show well is just how steep that trail is and how you begin to wonder how will I ever make it down! And these are the panoramas taken at the top. Wow, can you see so much from up there!